· Speed: The distance covered by an object in a unit time is called its speed. · Non-uniform Motion: If the speed of an object moving along a straight line keeps changing then the motion is called Non-uniform motion. · Uniform Motion: An object moving with a constant speed is said to be in uniform motion. Here the average speed will be same as the actual speed. · Speedometer: It is a devise to record speed of a vehicle in km/hr. · Odometer: It is a device to measure the distance moved by a vehicle. a) Motion of your hands while running. b) Motion of a horse pulling a cart on a straight road. c) Motion of a child on a merry-go-round. d) Motion of a child on a sea-saw. e) Motion of a hammer of an electric bell. f) Motion of a train on a straight bridge. Solutions: (a) Oscillatory (b) straight line (c) circular (d) oscillatory (e) oscillatory (f) straight line. Question.2: Which of the following are not correct? a) The basic unit of time is second. b) Every object moves with a constant speed. 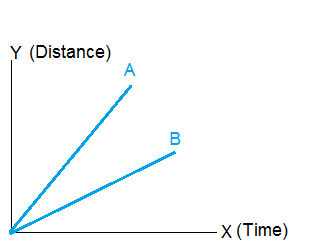 c) Distances between two cities are measured in kilometers. d) The time period of a given pendulum is not constant. e) The speed of a train is expressed ion m/hr. Solutions: (a) T (b) F (c) T (d) F (e) T.
Question.3: A simple pendulum takes 32 sec to complete 20 oscillations. What is the time period of the pendulum? Solution: We know that the time period of a pendulum is the time taken by it to complete one oscillation. = 1.6 sec. is the Time period of the pendulum. Question.4: The distance between two stations is 240 km. A train takes 4 hrs to cover the distance. Calculate the speed of the train. Solution: We know that speed the distance covered by an object in unit time. Hence, speed of the train = 240 km ÷ 4 hr = 60 km/hr. So the speed of the train is 60 km/hr. Question.5: The odometer of a car reads 57321.0 km when the clock shows the time 08.30 AM. What is the distance moved by the car, if at 08.50 AM the odometer reading has changed to 57336.0 km? Calculate the speed of the car in km/min during this time. Express the speed in km/hr also. = 57336.0 - 57321.0 = 15.0 km. is the distance covered by the car. Total time taken to cover this distance = 08.50AM - 08.30AM = 20 min. Question.6: Salma takes 15 minutes from her house to reach her school on a bicycle. If the bicycle has a speed of 2 m/sec, calculate the distance between her home and school. Solution: Speed of the bicycle = 2 m/sec. = 2 x 900 = 1800 m.
Therefore, the distance between her house and the school is 1800 m or 1.8 km. 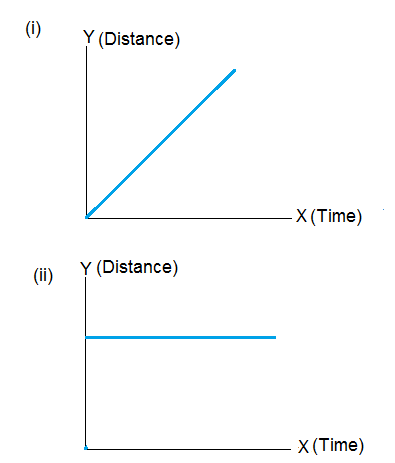 Question.12: The following figure shows the distance-time graph for the motion of two vehicles A and B. Which one of them is moving faster? Solution: Vehicle A is moving faster (Because in this figure slope of the graph of B is less than A).